Stephen is in his second stint at BRAIN. He was here at the beginning in 1992 while still working for a bike retailer in Santa Fe, New Mexico, where BRAIN was founded. He wrote several articles for BRAIN's first issue and later joined the staff, eventually becoming managing editor and then executive editor. After leaving BRAIN in 1997 he worked for several news organizations including The Associated Press and VeloNews before rejoining BRAIN as web editor in 2011. He became editor in chief in 2018. He works from a home office in Longmont, Colorado, with the assistance of Huck the Bernese Mountain Dog. He is an enthusiastic (but painfully slow) road, mountain bike and cyclocross rider. Dean's love of bikes bloomed after receiving a Schwinn Pea Picker Krate for Christmas 1972. After escaping serious injury despite that model having a Hurst-inspired stick shift mounted on the top tube, he moved on to BMX bikes and racing. Discovering girls in his late teens, he abandoned his bike somewhere in the front yard, probably upside down by the rake. It wasn’t until middle age and excessive weight began to creep when Dean returned to cycling, specifically off-road riding in South Florida. As the weight came off, his love of cycling took off and soon one bike became three, one-hour rides became four and leisurely solo rides became 26-person races through the woods until somebody puked. Dean is a 30-year veteran of the Florida newspaper wars, most recently at the Miami Herald as an editor for 16 years, where he was privileged to rub elbows with some of the country’s finest writers and fellow editors. Dean began his career as a staff writer for The Palm Beach Post, covering sports. He still enjoys racing, particularly 12-hour solo events on a singlespeed, and participating in gran fondos on his road bike. 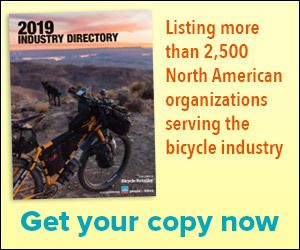 Patrick O'Grady was suckered into contributing to Bicycle Retailer and Industry News in 1992, when Marc Sani cleverly offered to "buy him a beer,” and he has been hanging around ever since, waiting for it. A free-range rumormonger who cartooned for his high-school newspaper and scored his first pro byline in 1974, O’Grady lives in Albuquerque, New Mexico, where he draws cartoons for BRAIN, reviews touring bikes for Adventure Cyclist, blogs at www.maddogmedia.com, herds cats, and rides rigid steel bikes with drop bars, rim brakes and bar-end shifters pretty much everywhere, including places he shouldn’t. Marc was in the second month of a four-month kayak trip exploring the nooks and crannies of Baja’s 800-mile coastline when he received a cryptic message from home. Call Bill Tanler. A quick phone call from Bahia de Los Angeles and the deal was struck. They would launch Bicycle Retailer & Industry News in January 1992. Tanler, who passed away from a heart attack in 1999, lived to see BRAIN become the dominant trade magazine in the industry. Sani helped steer the magazine over the years through several wrenching corporate transitions. Sani is a former wire service and newspaper reporter who thrives on news whether in print or on the web. He became interested in cycling and joined a local cycling club in the mid 1980s, but candidly admits that skiing is his first love and cycling was one way to stay in shape for backcountry powder. In 2013 Sani stepped into a new role as Staff Writer as Megan Tompkins took over as BRAIN's third publisher. Colin brings broad experience to BRAIN as Design and Digital Manager. Before Joining BRAIN as an employee, Colin contracted to redesign, develop and maintain the most recent version of bicycleretailer.com as well as contribute graphic design for the Interbike Dailies. Besides contract work for BRAIN, Colin was the Art Director for Mountain Gazette magazine, has contributed design to the High Country News, and has experience as web developer, designer, project manager and brand strategist both as a solo freelancer and for multiple digital agencies. Colin rides the mountains and mesas on both road and mountain bikes near his home in Paonia in Western Colorado. Ron has more than 20 years of magazine production experience. Early in his career he was fortunate to work at media and trade show giant Miller Freeman. There, Ron was taught all he knows about magazine production by the legendary Andy Mickus. Just give Ron a deadline and he's set to go. At BRAIN, he puts a significant emphasis on customer service and tries to make it easy for companies to do business with the magazine. Ron has handled thousands of closes; he never panics and (almost) always delivers. He values his working relationship with sales, editorial, and creative staff.